Classic Western Montana fly fishing is sight casting dry flies to rising trout on a river float trip, usually from a McKenzie style drift boat or inflatable raft, depending on the river being fished. This type of fly fishing trip with an expert guide at the oars is a very relaxing and enjoyable experience, and exactly what we specialize in here at our lodge. 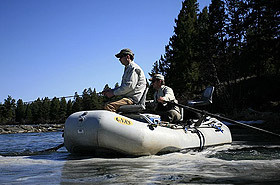 We also offer overnight river fly fishing float trips through licensed Montana Outfitters. On top of that, you can experience some of Montana’s finest wade fishing right out the back door fly fishing Rock Creek, a legendary blue ribbon trout stream. Six species of salmonids thrive in our western Montana trout streams. Of these, 4 are called trout; rainbow trout, brown trout, cutthroat trout, and brook trout, although the brook trout, like the bull trout, is actually a char. Of these “trout”, only the westslope cutthroat is a native trout. All rainbow, brown and brook trout in our rivers and streams are wild, since no stocking of moving water has been permitted for over 3 decades, but they were originally introduced. The other two salmonids are both native. The bull trout is the inland brother of the Dolly Varden, and the other native is the mountain white fish. When it comes to fishing guides, you are in good hands with courteous and friendly professionals who are all well versed in fishing Montana trout waters. From stillwater gems like Georgetown Lake to fabled rivers such as the Bitterroot and Clark Fork they will have you casting to trout in no time. As our previous guests can tell you, every day spent on the water is a treasure and we will make every effort to grant your requests. Above all the guide staff members are here to make sure that you are safe, comfortable and having an excellent trip in our trout fishing paradise.